The intervertebral discs between the bones of the vertebrae help cushion the bones and allow for smooth and painless movement. These discs are composed of collagen and start out very soft, but gradually harden as we age and provide less support. When the discs become damaged or misplaced, symptoms may arise, causing pain that radiates throughout the body. 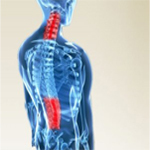 We offer several non-surgical treatments for spinal disc disorders.